Never has a soup taken me so long to prepare. The black beans have to be soaked for at least 10 hours, and while we never have a cool enough temperature in Tenerife for soup, I do make exceptions. This thick, healthy and wholesome bowl makes a very satisfying lunch. 1. Drain the beans and put in a large saucepan. Pour in boiling water to cover the beans generously and boil rapidly for 10 minutes. Reduce the heat and simmer for 1 hour, until the beans are tender. Drain the water and put to one side. 2. Heat the oil in a saucepan and add the onion and garlic. Cook gently for 5 minutes. Stir in the chilli, cumin and coriander. Add the beans and stock. Bring to the boil. Reduce the heat and simmer for 10 minutes. 3. Pour the soup into a blender and blitz until smooth. Stir in the lime juice, salt and pepper. 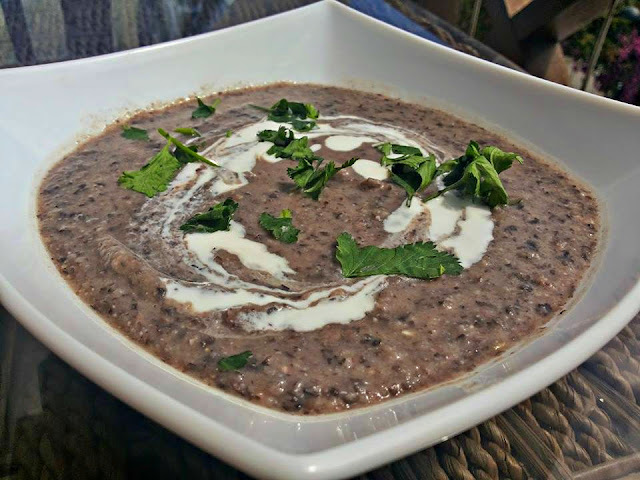 Ladle the soup into bowls, topped with the sour cream and garnish with the chopped coriander.